Nutritional supplements enable our bodies to get the proper minerals, vitamins, and chemical compounds needed to function optimally. Sadly, in today's high-stress and polluted world, it is almost impossible to get the nutrients we need from our foods (even if you eat super organic foods, you may end up short). So, which nutritional supplements do you actually need? Having trouble taking the test on an Apple device? Please use a non-iOS device or laptop or try taking the test on this other page. We are experiencing some technical difficulties rendering the test on mobile phone for Apple devices. Thank you for understanding and enjoy the FREE test! Remember, do not use the results of this test as a diagnosis. To really know which natural supplements and compounds are best for your body, contact our holistic health experts and nutritionists at Holistic Bio Spa. How? By reviewing your dietary needs, health records, and goals, we will then be able to accurately tell you if these supplements are best for you! We can also help you set milestones and coach you on how to live healthy in a far-from-perfect world! ‘‘If you are the kind of person who wants to step up and take good care of yourself, believe me it's never too late (I'm 61 years old). The Holistic Bio Spa is the place to make it happen. I highly recommend it and will continue to post as I get deeper into the treatments recommended for me. We're an open book. 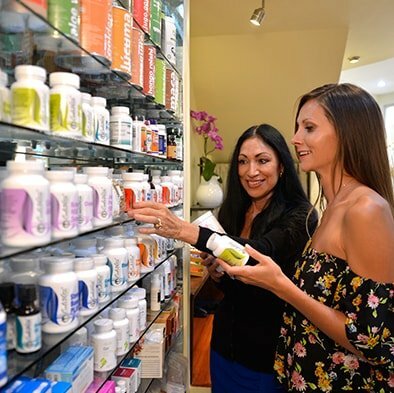 Meeting with our holistic health experts and nutritionists will help determine which vitamins, minerals, and other nutritional supplements your body needs based on your diet, lifestyle, and health history.